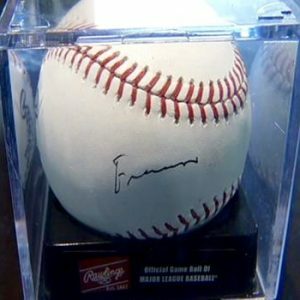 Pope Francis is very popular as a relatively new Holy Father, but he was somewhat unknown as a cardinal in many respects, and his autograph for that reason is very rare. Yet I have this autographed photo of him. 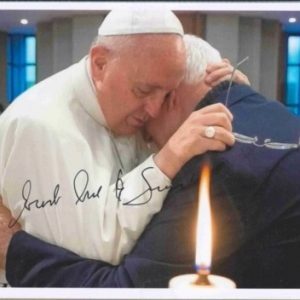 The reason we talk about him with John Paul II is because it is an autographed photo of Cardinal Bergoglio as he is being elevated by John Paul II. 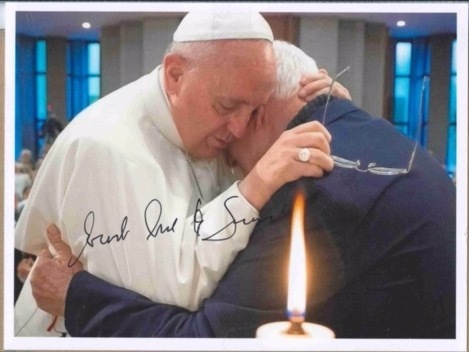 So it’s a photo of the two of them together, signed by Cardinal Bergoglio, soon to be Pope Francis. Again, it’s very rare—the fact is that we know how simply he lived as a cardinal in regards to spending money. 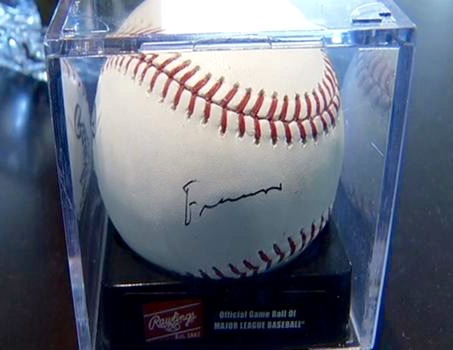 He never would sign autographs for people through the mail. You could only get an autograph in person. 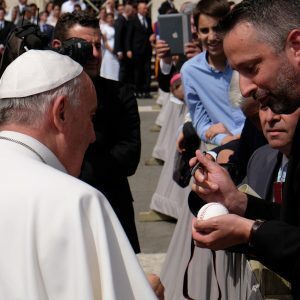 And so that makes it very hard to get any autograph of Pope Francis in any form but especially when he was a cardinal. I’m always impressed by the brotherhood of the priesthood. 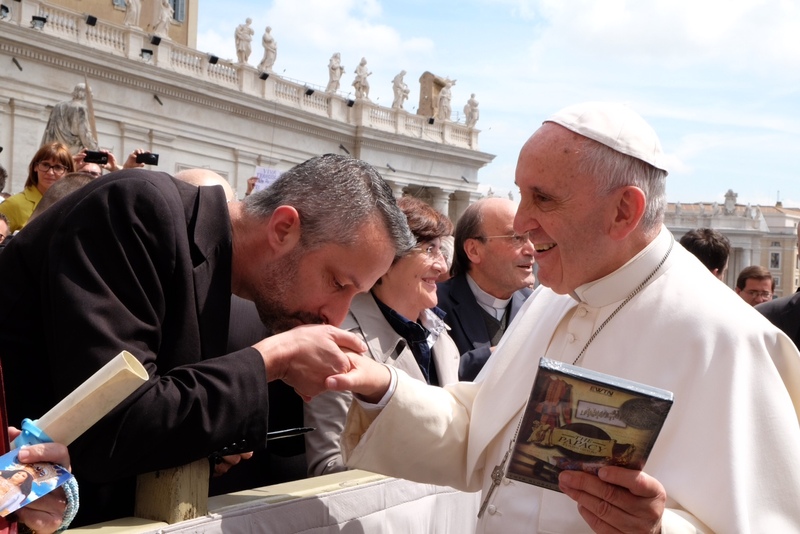 You can also see that in this photograph as well as the recognition that Pope John Paul II will now be canonized by Pope Francis. 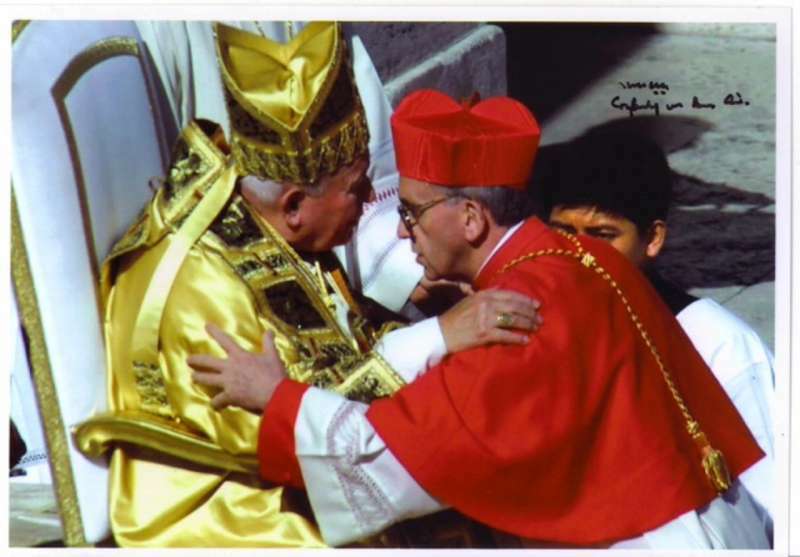 They were really brothers in this life and especially in their priesthood. 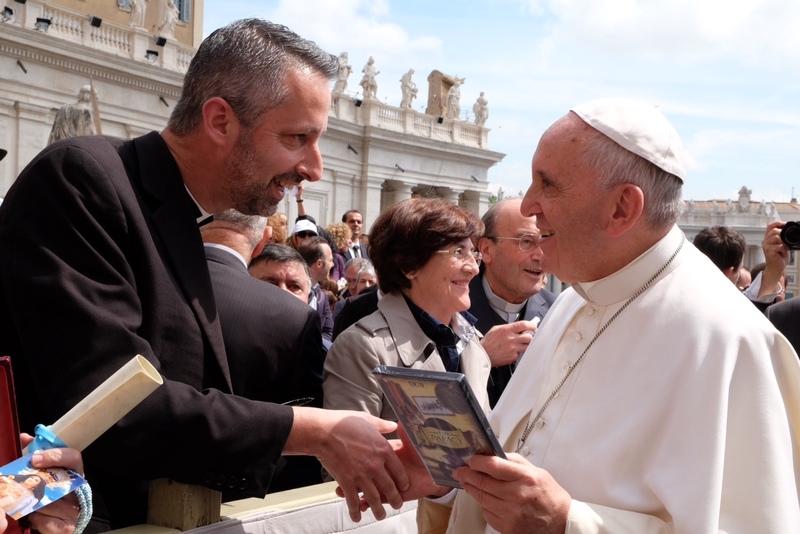 Sharing the priesthood: you can see this in this photograph. 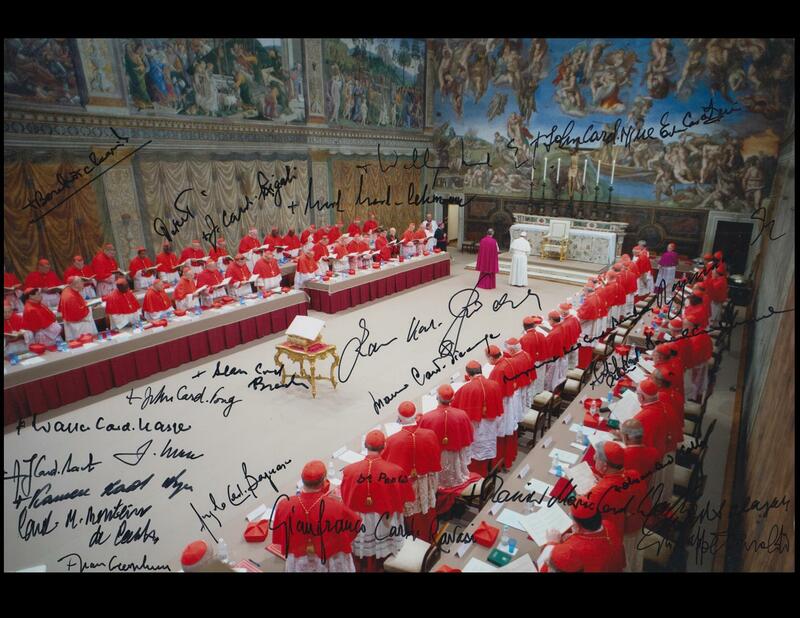 This photograph was taken during the conclave of the consistory that elevated Bergoglio to the cardinalate. 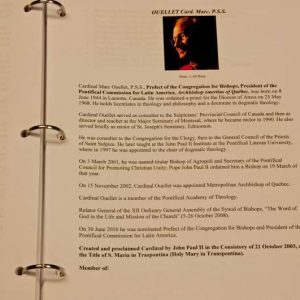 It was the largest consistory elevation of cardinals in the history of the church. Historically speaking, in more than one way, it was choosing the future pope. It’s also interesting that Pope Francis is the first pope, obviously, that was made a cardinal by John Paul II—the last three popes were elevated by Pope Paul VI. I love the fact that he puts Bishop of Buenos Aires below his name. He takes such pride in his role as bishop. 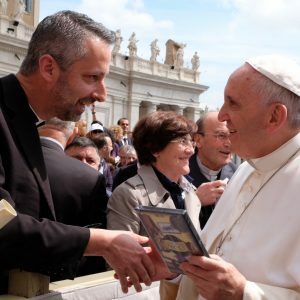 And he’s assumed the great role of being the Bishop of Rome now as one of John Paul II’s successors. A press release issued from the Vatican’s Catholic News Service stated the following message regarding the 2001 Consistory: Presiding over the largest consistory in history, Pope John Paul II created 44 new cardinals and asked them to “shine in wisdom and holiness” as they guide the Church around the world. 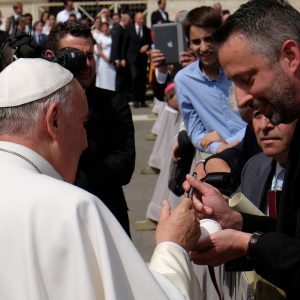 During the ceremony in St Peter’s Square on February 21, the Pope said that, in elevating the new cardinals, the Church was not celebrating earthly power but a sense of service and humility. 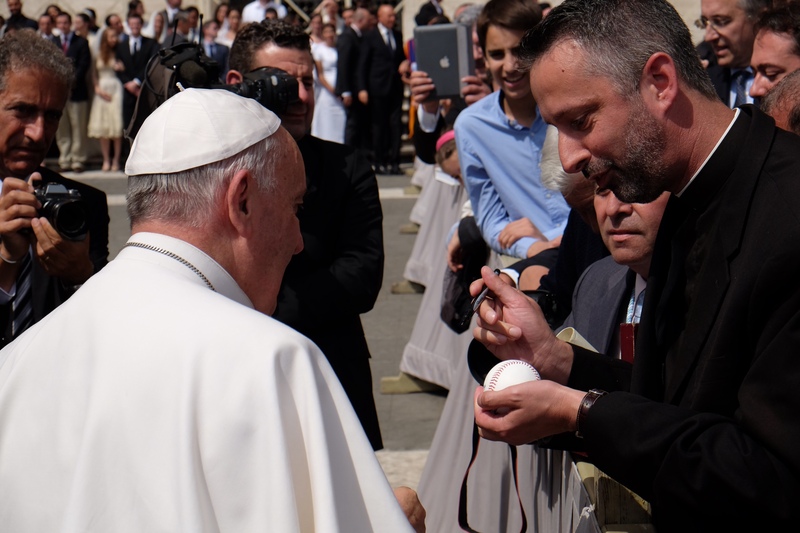 “Whoever wants to be great among you will be your servant,” the Pope said at the start of his sermon, quoting Christ’s words to his apostles. 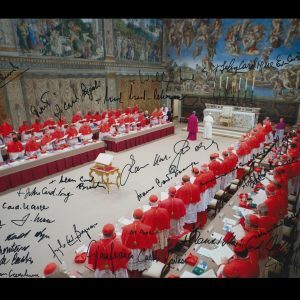 The new cardinals included the heads of major archdioceses, Vatican officials, eminent theologians and a long-time personal friend of the pontiff, as well as several Church leaders who were persecuted or hindered by authorities during their pastoral careers. 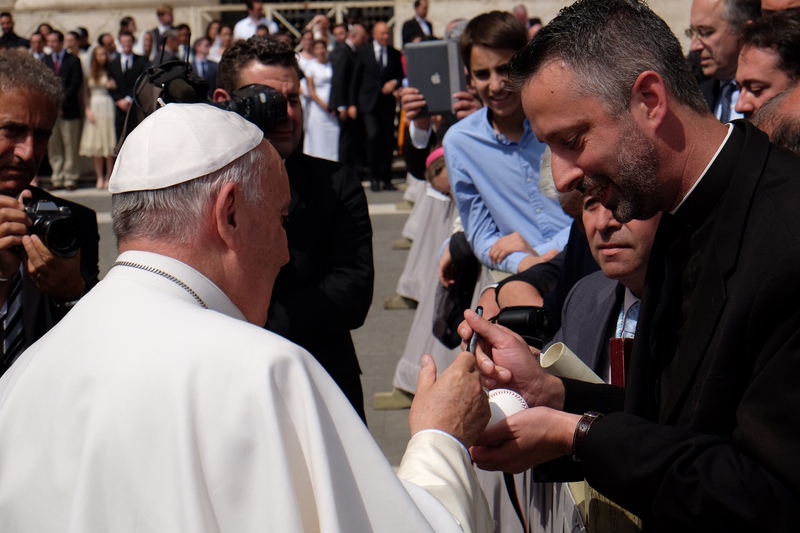 They came from 27 countries and five continents – a geographical mix that the Pope said highlighted the Church’s global presence in the 21st century. 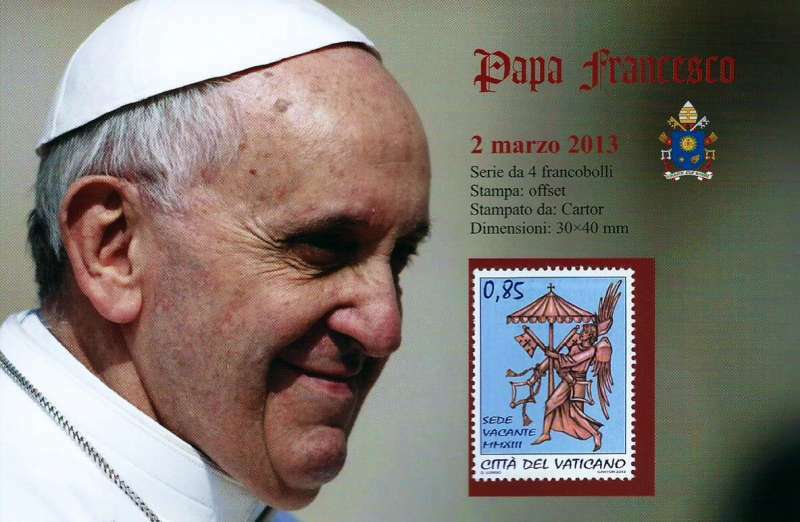 It was the eighth of nine consistories for the creation of cardinals called by John Paul II. 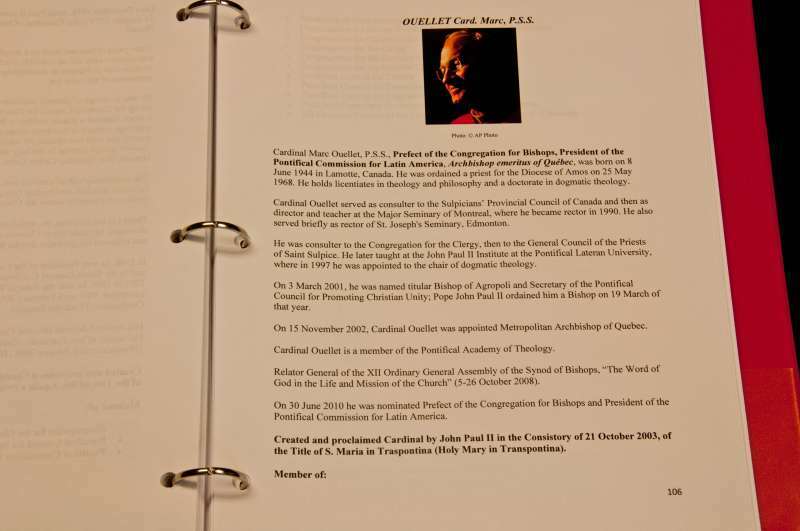 It was also the consistory in which most cardinals were created in the history of the Church, with a total of 42. 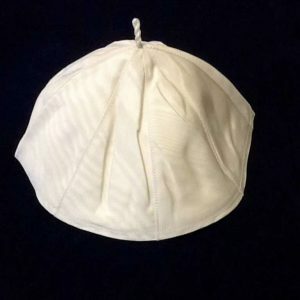 For the ceremony, Cardinal Bergoglio used the same clothing as his predecessor, with the exception of a few adjustments tailored in his size. 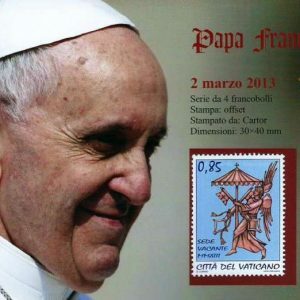 Papal Artifacts celebrates this anniversary with him! It’s a very nice item to have in the Collection with the association of the two of them together. St. John Paul, pray for us! Our Holy Father, Papal Artifacts honors the gift of your life to our Church.